If you fancy putting your creative prowess to use, then Landmark might be your cup of voxel tea. It’s not finished yet, but it’s still floating about in Early Access, so you can buy your way in early. The cheapest pack, the Settler Pack, would normally set you back £14.99/$19.99, which is a little pricey for a game that will be free at launch. You get early access, a title and a pickaxe for your cash. If it’s the price that’s been keeping you away, then you might be a bit more interested now. All packs are 66 percent off for the next day, which is quite the discount. We got Mr. Cobbet to check it out back in March, so take a gander at his Landmark closed beta review to see if it tickles your fancy. The Trailblazer Pack is where you’ll get the most bang for your buck, but it’s also the one you’ll need to drop the most cash on. For £25.83/$33.99 you’ll get all the stuff from the other packs along with some unique gear and 4 extra codes to give to folk you really like. Normally it’s £75.99/$99.99. 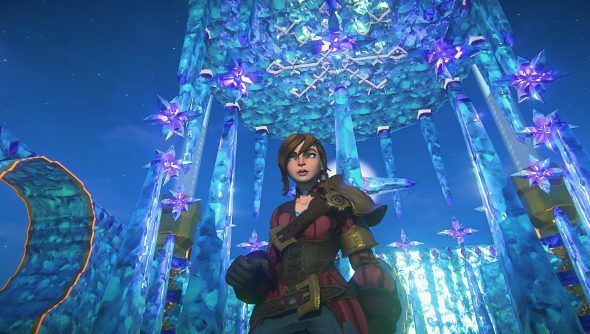 So what can you get up to in Landmark, anyway? Well, you build. You build like you’ve never built before, unless you are a builder or someone who plays a lot of creative games. Regardless, there’s a lot of stuff you can construct if you set your mind to it. We put together a list of some of the coolest things folk built in Landmark, pouring their blood, sweat and tears into way back in February, and while there are undoubtedly even more now, it’s still well worth a look. Are you tempted to buy in?